Werlatone continues to expand on its growing line of Multi-Octave RF devices with the Model D9649. 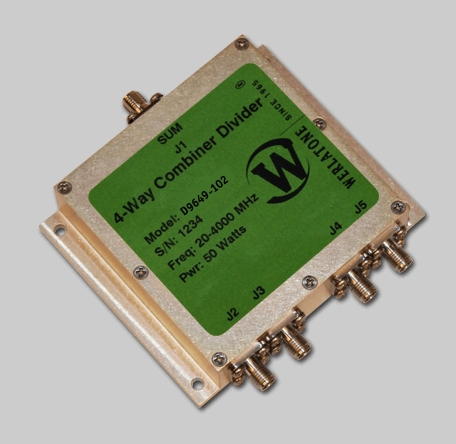 This wideband 4-Way Combiner offers 12 dB minimum Isolation, and operates with less than 1.5 dB of Insertion Loss. Measuring just 3.35 x 2.75 x 0.85", the D9649 is ideal for wideband amplifier applications. Werlatone continues to expand on its growing line of Multi-Octave RF devices with the Model D9649. This wideband 4-Way Combiner offers 12 dB minimum Isolation, and operates with less than 1.5 dB of Insertion Loss. Measuring just 3.35 x 2.75 x 0.85″, the D9649 is ideal for wideband amplifier applications.